Learn how how to use SSML tags to change the way Alexa speaks. 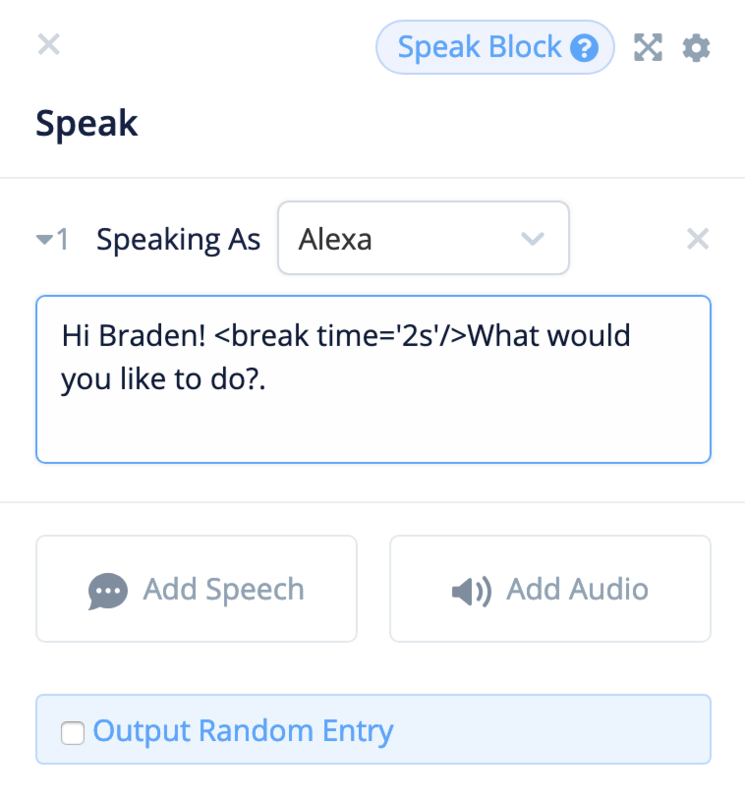 "Hey, I <loud>REALLY WANT</loud> want to go outside...<quiet>please?</quiet>"
You can use SSML tags inside of SPEAK blocks in Voiceflow. Below I have outlined several popular examples of SSML tags you can use, but the full list is here on Alexa's developer blog. The amount of time can either be in seconds (s), or miliseconds (ms). Remember to add the forward slash after the pause length, otherwise your tag won't work! SSML tags enclose a section of text in the Speak block with the starting & closing SSML tags for that particular tag. In the example above, you would find the category of effect you want, such as prosody, followed by the type of effect and the level of effect, all in the opening tag. After enclosing the text you want to affect, you add the closing tag with a forward slash and the category of the effect.